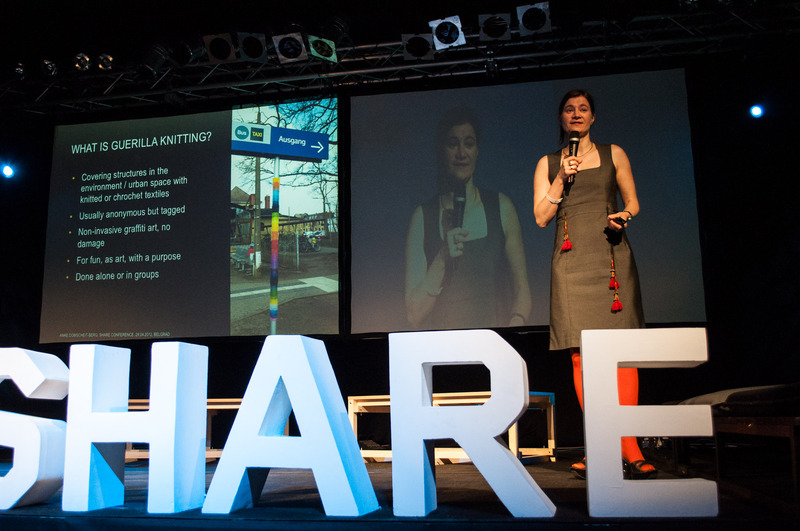 In April 2012, I was invited as a speaker to the inspiring Share conference in Belgrad. 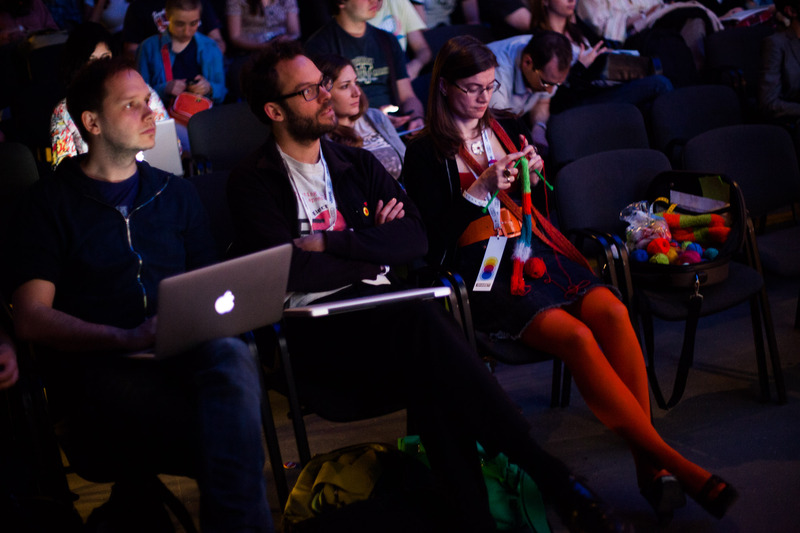 I had a funny mix of engagements there, talking on a panel covering open government, at a press conference on ACTA (and other really bad legislation which would attack our freedom) but also giving a full talk on guerilla knitting :-). More than app 100 people listened to me presenting on what is yarnbombing, how is it done and how it actually looks like. 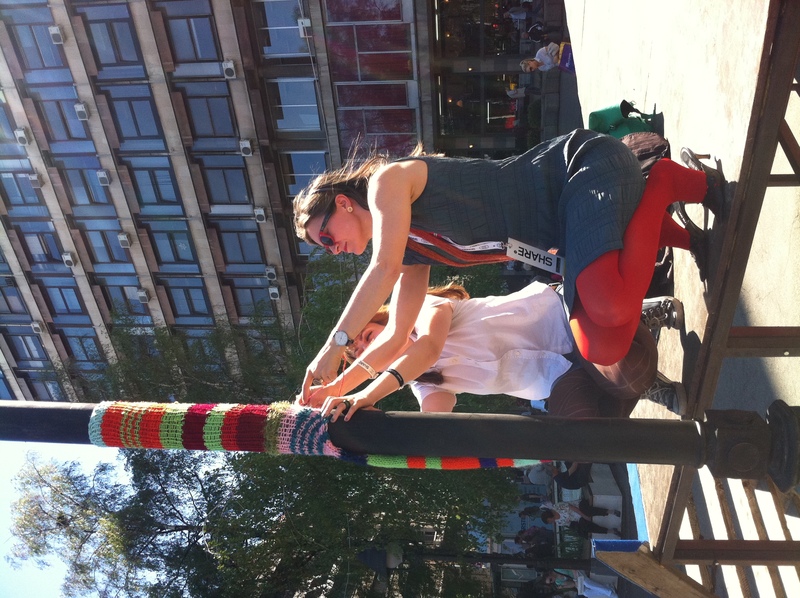 I also gave a workshop on guerilla knitting and I was knitting throughout the 3 days of the conference to beautify the venue itself as well as Square Republic in the city centre of Belgrad. Here I am, knitting like in all sessions I attended. In case you wonder – YES, I actually listened to the sessions and most of the time, I didn ‘t even need to look at my knitting. I had always a bag with wool and all else I needed close by. Very handy. Inside the building, I covered a hand rail at the stairs leading to the main hall, as well as two small tables. 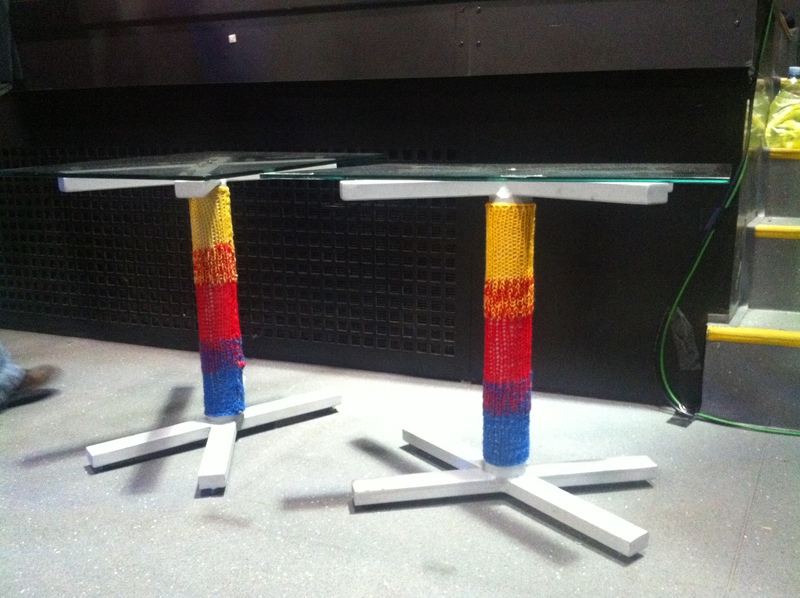 And these were the tables… covered in the colours of the share conference logo. 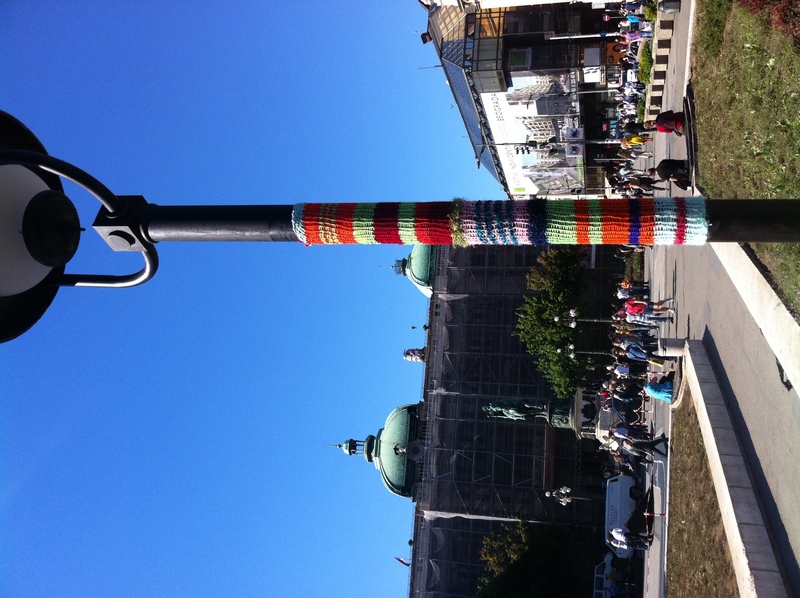 Outside, I had two more knitting projects: a traffic sign post in front of Dom Omladine, the conference venue, and a large lamp pole at central Square Republic. 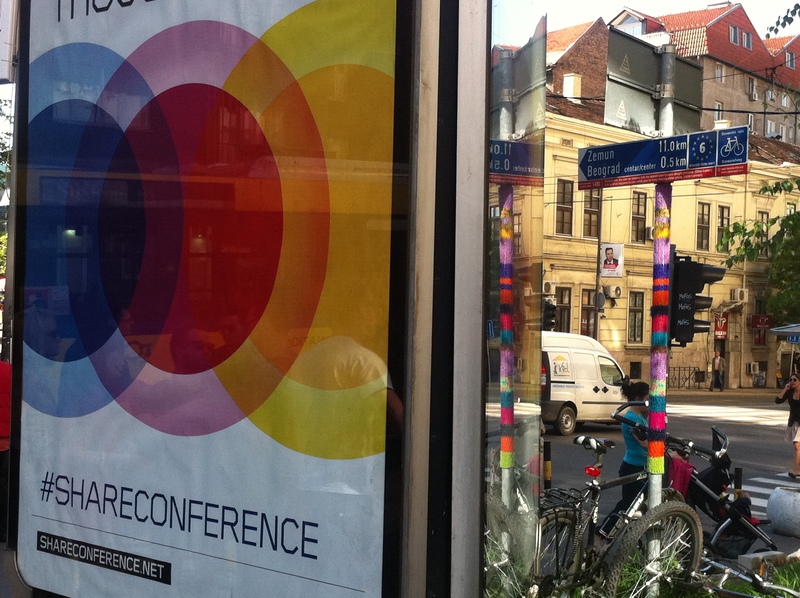 The traffic sign post nicely matched the rainbow colours of the share conference logo (see the poster left in the pic). I had help from two participants of my guerrilla knitting workshop at fixing the yarn bomb at the lamp pole. We were lucky since there was a wooden stage left from a former event, with convenient stairs, so we could easily stitch the yarn bomb around the lamp pole. Only hours later, the stage was gone and the knit hack hang too high for average vandals to be reached for damaging :-). We had so much fun there and enjoyed the curious looks of passers-by but also the great sun shine. 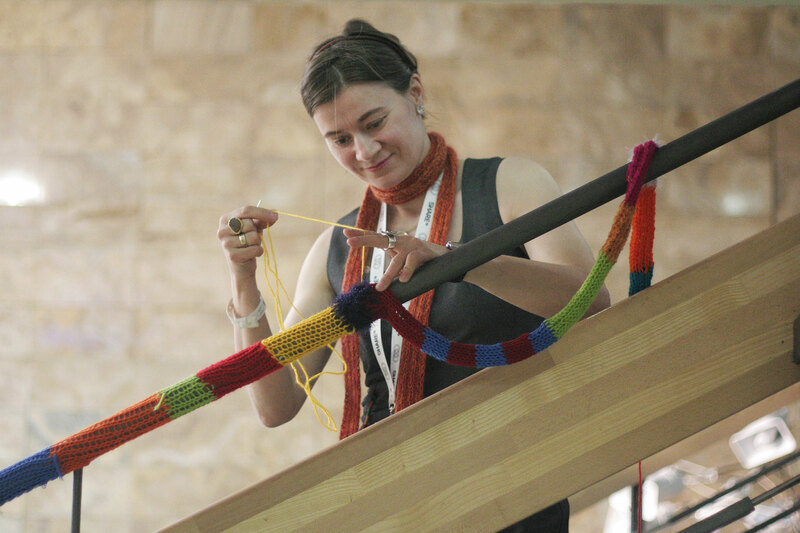 Other participants seem to like the knitting a lot and there were some reports about it in Serbian and international blogs/online media. 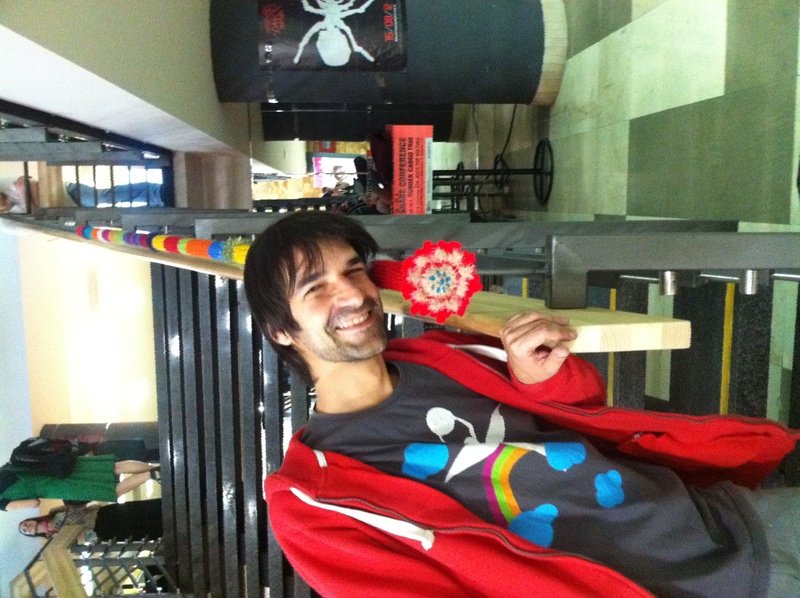 See the Belgrad guerrilla knitting picture gallery for more pics! All pictures (except those which have a caption stipulating otherwise) are mine with “some rights reserved” – applicable license is Attribution Non-Commercial (CC BY-NC). For reference see Wikipedia. This entry was posted in beautifying urban landscape, Nitthaeck projects, Uncategorized and tagged Belgrad, flower, hand rail, lamp, Serbia, Share conference, table, traffic sign. Bookmark the permalink. Great post, awesome pictures! If only I had had a wooden stage to protect the yarn bombing I crocheted in Berlin-Neukölln to beautify a street sign … (http://bit.ly/1dkjztw).